Cradle your head with the fluffy comfort of this beautiful pillow from Hotel Grand. Crafted with a soft, white cotton cover with a 500 thread count, the tone-on-tone cabana stripe pattern shell protects against allergens and mites. The pillow features a down and feather fiber fill with a 600 fill power that provides you with the plush feel and luxurious loft you need for a great night's sleep. I've had a 100% down pillow for many, many years which has seen better days and needed replacing. After losing my job in December due to the economy, I've been frugal with my spending. I decided to try non-down pillows from department stores to save some money. After buying two pillows from two different stores and then returning them because they were not comfortable, I decided to check Overstock.com. I really, really wanted another down pillow and the price at the department stores were just too expensive! When I read the ratings on this pillow and saw the fantastic price, I decided to purchase one. Lo and behold, I'm IN LOVE with this pillow!!! I purchased the Jumbo pillow as I'm a scruncher. I like a huggable pillow that I can mold to my head and body and this is THE pillow. If you are looking for a very soft, huggable pillow, this is the pillow for you. I couldn't be happier, plus I'm sleeping so much better! 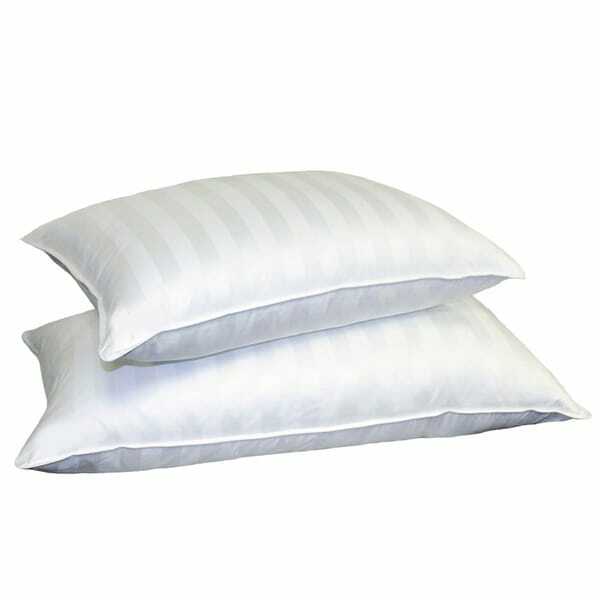 Siberian White Down 500 Thread Count Pillow is a great pillow at a great price. I'm a big fan of the Hotel Grand line. My down comforter is that brand and I love it. My reason for a 3-star review is that 1) even though the listing says "soft," this a lower density or fill power than I would have expected. Maybe others can help me, but I don't know why it substantially matters what the thread count is. Perhaps it prevents the nature of feathers to poke their way out, but I use a pillow protector and of course a pillow case so I can't see any advantage in the thread count. Unless I'm missing something, pay more for the higher fill power, and not the higher thread count, if looking at other products. I love it, and just ordered a second Hotel Grand Siberian Down 500 Thread Count Pillow to have a matching set of very nice, very comfortable and supportive Hotel quality pillows. If you are looking for a great pillow, this one is like sleeping on a cloud, and it conforms to your personal alignment for all night comfort. Nice pillow, but it is smaller than stated size. I bought the standard size and it is only 19 x 25 inches, instead of the 20 x 26 inches it was supposed to be. It is a full inch smaller all the way around, so this means it will be slightly small with respect to sizing used for standard pillow shams. I'm ordering my 3rd Hotel Grand Siberian White Down 500 Thread Count Pillow. The 1st one lasted many years. The 2nd one, I left on a trip. So I'm ordering another one. I sleep so well on this pillow, I will order them as long as they make them. Thanks! These Hotel Siberian White Down Pillows were bought as a gift for my daughter and son-in-law. They didn't smell like some down products do when you open them, they are so soft yet supportive, and the covers are definitely 500 thread count. These pillows provide marvelous comfort for your head and neck, and they were priced right on Overstock. Patricia S.
I'm always looking for the perfect pillow, and I finally found it in the 500 thread count Siberian White Down Pillow! I don't have to fight with it and beat on it to make it fluffy. But, I can mold it the way I want to around my head for support and comfort. It's a wonderful pillow! Pillows are too soft and do not come back to their shape as a 100% down pillow would. The description said 100% Down, but the tags on the pillow say "minimum 75% down". I'm very disappointed as I've bought products from Overstock before and was happy. Now I am hesitant to buy from Overstock as I wonder if their descriptions are not what products truly are. Some years ago I developed serious pain in my neck; the chiropractor told me to toss my synthetic pillows and switch to down. So simple, but it really helped. My old pillows were getting a bit flat, so it was time to get new ones (to test if your down pillow is "broken", lay on a flat surface and fold in half; if it stays folded and doesn't immediately spring back, you need a new one). Price is reasonable (check out department stores - you'll be shocked! ), cotton cover feels thick so hopefully down will not seep out (too early to tell). Pillows are very soft, so if you're looking for firm support, these are not for you. Good for side or stomach sleepers. Great value, very pleased so far. This pillow was advertised as Siberian white down. I expected a 100% down pillow, but what I got was down with a core of something else -- probably feathers. There is a big difference. I would have returned the pillows, except I had already discarded the packaging by the time I realized the problem. I was pleased with delivery, a lot faster than I planned for it. The 500 hundred thread count materal was really exceptional & with down I order a larger pillow thinking it will compress down. These pillows are really fluffy. I woul recommend them to my friends. These pillows were what I was looking for. Not too big nor too small. I did put them in the dryer for a few minutes before using and they fluffed up nicely. I like a pillow that does not force my head up high but provides a little loft and these fit the bill. This pillow is way underfilled and not at all what I thought I was ordering. I have just been to a department store & purchase a pillow that was more filled. Very disappointed. Pillow is soft, comfortable pillow but hardly worth the price for ONE pillow. The ad pictures TWO pillows when they are selling one and is VERY misleading! Picture of TWO (2) pillows when they are selling ONLY ONE misleads a customer. I am considering returning it because it is over-priced and misleading advertisement. The pillow is very nice, however.i feel the price is high for what you get. I was expecting a much higher fill to the pillow. Even though the main photo shows 2 pillows the purchase is actually only for 1 so pay attention when buying. First, this pillow is absolutely NOT jumbo sized. It seems much smaller than a standard sized pillow. False advertisement. It holds no shape at all, because there's barely anything inside of it. Total rip off. I cannot believe they charge what they charge for it. I'm returning this terrible falsely advertised item. It's a bummer, because it causes one to pause prior to ordering from this website when this happens. The pillows were nice and my husband loved them. They turned really fat after a month of use and we couldn't get them fluffed back up. Very comfortable but quite a bit smaller than I expected. Very nice pillow easy on my neck. I love goose down pillows and these are five star pillows. They are big and long and are awesome if you need to prop your shoulder up. I had a frozen shoulder and these pillows really came in handy. "Will the jumbo pillow fit in a standard pillow case?" No, it is not a good fit for standard cases - need the queen size. "Is this pillow extra soft, soft, medium, or firm?" I have been purchasing these pillows for myself, children and grand kids for years. I would say they are on the soft side but not too soft. I use 2 of these pillows in the jumbo size, one for a little extra support without being too firm. They are the most comfortable pillow I've ever used. I especially love that they rarely shed a feather. I toss them in my dryer with some tennis balls to fluff them every now and they come out big, fluffy and like new. I've also laundered them in my front loader and they too were like new again with no shedding! This is not a pillow you'll need to replace often because they are very durable. To me it is medium. I like to plump two pillows up under my head so for me it is perfect. Very comfortable pillows. "Is the price for one pillow or a pair?" It is for one pillow. "What's the answer to the description not being correct. What is the down percentage of these pillow. Are they in fact 100% White Siberian Goose down with 600 fill rating. This ? hasn't been answered since 10/18." Hello francesfs, the percentage of white down is at least 75 percent with the other 25 percent being feather fibers, down fibers, and feathers. Thanks for shopping with us! "What is the down percentage of these pillows? Are they 100% down as implied in the description? Thanks." Hello lat, thank you for your inquiry. Unfortunately, the information you have requested is currently unavailable. You will receive an email notification once an answer is posted. Have a great day. The tag on the pillow says "minimum 75% down"